was presented to Brad Hillman, at the 2019 LLA Annual Banquet. He was also the receipiant of a PBA Pro Bono Award, by PBA President Charles Eppolito III. The Pro Bono Program in Lycoming County is designed to provide representation, and other services to poor people who qualify for NPLS. That is what we have asked the attorneys to do and they have undertaken to answer that call for help. And that is literally what we ask—please answer the call, email etc when it comes and take on the cause if you are able. As with all causes there are some administrative duties that must be done to make the program work for those it is intended to serve. Those behind the scene duties include, making that call to find a willing and available attorney. Often the turnaround time between the call and the court date is very short. So when we find an attorney who tells us to call whenever we are stuck, who returns calls timely, and according to Becky NEVER has said no to her plea unless he has had something scheduled the same time, you can imagine how easy it would be to take advantage of that offer. We try not to—take advantage that is-- and tonight’s recipient assures us that he doesn’t feel taken advantage of. 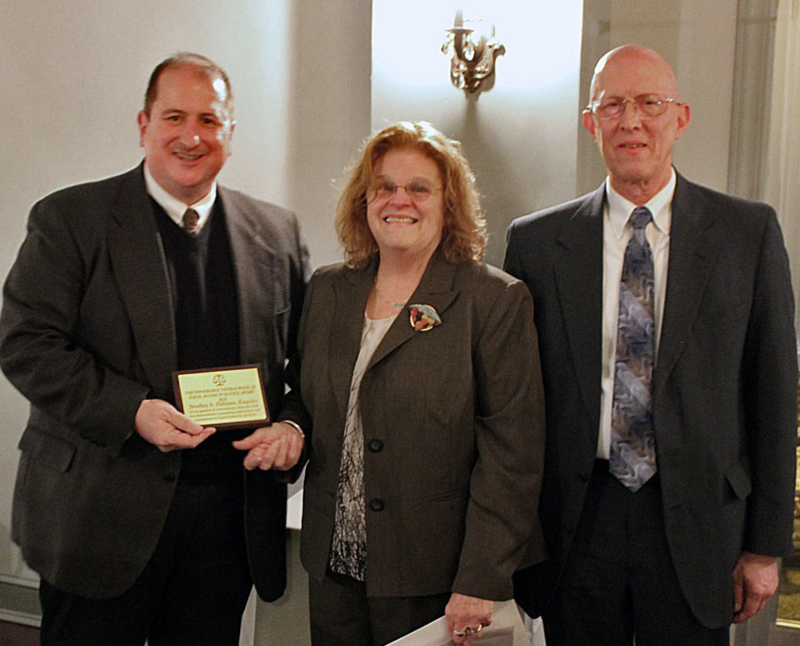 Tonight we honor him not only for all the service he has provided to clients in Lycoming county, on a Pro Bono basis, but also for helping us streamline the referral process , allowing us more time to serve others and helping Becky keep her sanity. Knowing there is someone in the wings we can most certainly count on when we have gone through our list and time is short is immeasurable. Tonight’s recipient has been on the PFA panel since 1999. Between that time and 2018 he represented 45 PFA clients. In 2018 he took an additional 11 cases. (More than his Fair Share) The most recent referral was for a hearing on New Year’s Eve. Becky, having exhausted the list, took him up on his offer to call when stuck and, despite his office being closed, he agreed to take that case. Hearing there were 2 cases at that time he offered to take a second if need be. In addition he has shared his family law expertise in agreeing to be a resource for NPLS attorneys and paralegals when cases have issues that involve areas we don’t generally handle such as support and divorce. (Our Family Law Paralegal said he was a go to person for her). He has also taken some custody cases over that time and it probably goes without saying that they are the most difficult cases for which to get pro bono help. For answering the phone, returning calls, proffering your services and above all for all the clients you have served-----NPLS and the Lycoming Law Association honor Brad Hillman with the Thomas Wood Equal Access to Justice Award. Pro Bono Awards presented to Brad Hillman. The 2018 Honorable Thomas Wood. 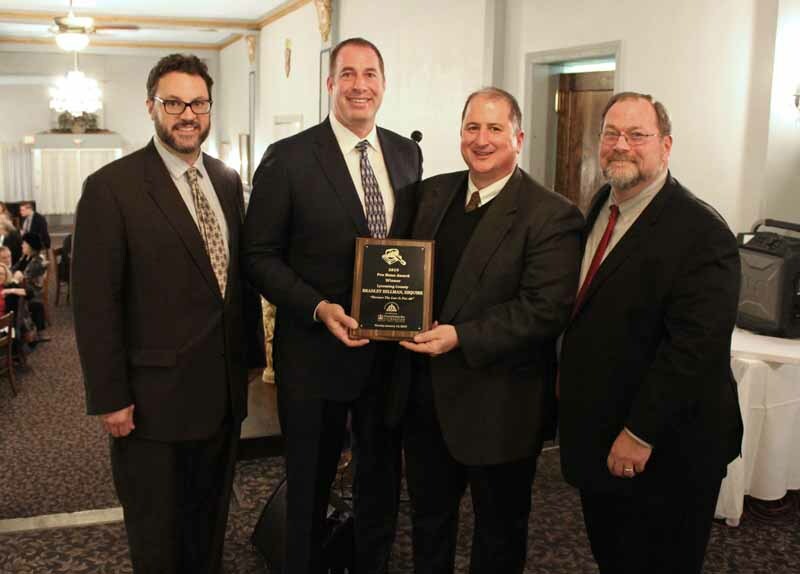 Jr., Equal Access to Justice Award was presented to Brad Hillman, at the 2019 LLA Annual Banquet. He was also the receipiant of a PBA Pro Bono Award, by PBA President Charles Eppolito III.